AMONymous: Have you read the book? 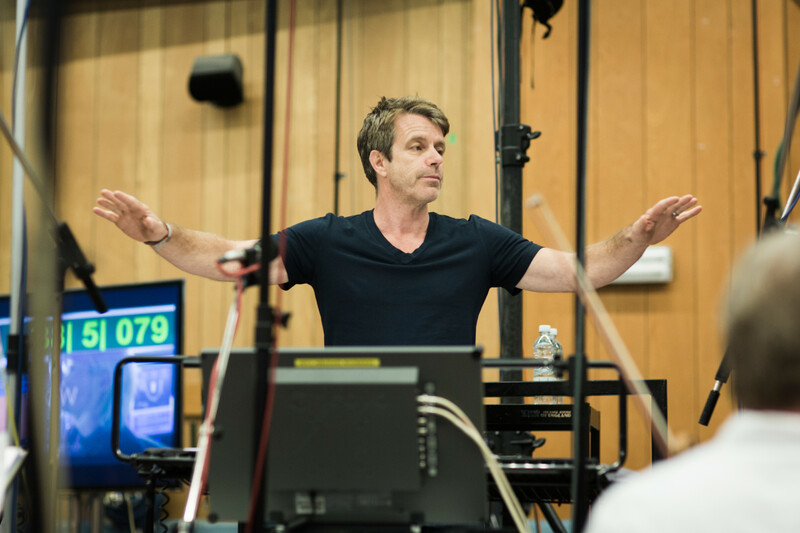 Harry Gregson-Williams: I read the script, which is apparently as good as the book and the film is as good as the script. We’re in very good shape. Of all the films that I’ve done in the last twenty years…often one thinks “this script wasn’t quite fully written” or “he didn’t film that”, but the script is really good. The movie is smart and unexpectedly funny yet unique and tense in places. It’s got all the elements you’d want in a film so I suppose I’m quite critical by now [laughs]. It’s very different to the last films that I’ve done with Ridley Scott with Kingdom of Heaven and whatnot. What makes it so fun for me is the unique nature of the thing, being set on Mars. It’s a concept I’ve never done before. HGW: It is, but the way that Ridley’s screenwriters sorted it out is that we’re constantly in touch with what’s happening on Earth, and the way he’s done it – and I suspect this is probably what would happen when there was a manned mission to Mars if an astronaut got left behind alive – I should think that there would be some sort of rescue mission put into place. I think the whole planet would be interested in that and actually they would have a public right to know. Certainly in this film, NASA can’t be selective about what they tell people. They would have to come clean, and therefore it would be of interest to all of us. There’s a real touch of humanity about the film, with the viewers hoping he can get off this planet. He’s the first person to be completely alone on a planet. A: You said you had read the script: is that when ideas start generating for you or is it when you see the first cut? HGW: It’s really with the first cut, although of course I can start thinking and wondering. Really until the first meeting with Ridley Scott when he shows me his rough cut – which is what he did about three months ago. So it’s a quick turnover and there’s no time to hang about. As a film composer there’s no time for sitting about in your candlelit window waiting for the news to hit. You’ve got to get on with it, it’s music to order. I don’t see myself as anything particularly different to the costume guy, production designer, wardrobe person…we’re all part of a team. And a good director makes you feel as though you are part of a team and Ridley is that. He’ll show you the direction he wants you to go. First and foremost he’s an artist. That’s what he does most mornings with his time, if he’s not shooting. He talks in a language I can interpret. Art and music share a lot – tone, colour, texture. These are all things he talks to me about and I have to translate that musically. In any given scene he might listen to my queue for that and say “I really want the audience to feel a little bit more threatened”, or “I want the atmosphere to feel a little bit lighter” and I have to interpret that. That’s part of the deal of being a film composer. It’s definitely a collaborative process, there’s no doubt about that. To be a successful film composer you’re going to have to let the composer into your world. What that means these days is being a programmer and a demo artist. I guess Steven Spielberg probably says to John Williams “Can I hear that tune on the piano?” and perhaps he bangs it out and then they see each other with a big symphony orchestra. I’m sure Spielberg probably trusts John Williams enough at this stage to come up with the goods. But for the rest of us mere mortals that’s not going to happen. Ridley wants to know what you’re getting and he wants some impact on what he’s going to get. By hiring a composer you’re aware of their body of work and where they’re likely to come from it, but as a modern film composer I am constantly demoing my cues as I work my way through the film. We call them mock-ups; I have a lot of machines that store sounds that imitate very clearly a symphony orchestra. For instance in a different cue I might play Ridley some music where the French horns take the lead and he might say “What would happen if it was an electric guitar playing the lead or what would happen if it were as simple as a piano”. So then I’ll adjust things and show him again so he has some impact and some input. A: Having worked with him previously, does that mean that the relationship has become more symbiotic? HGW: It does. There’s a certain shorthand. I spent a lot of time in the last 20 years with his brother Tony Scott. As you know he sadly isn’t with us anymore but I did all of Tony’s films since Enemy of the State in 1996. And one thing led to another; from Enemy of the State to Spy Game, from Spy Game to Man on Fire, from Man on Fire to Déjà vu, from Déjà vu to Domino…these are prolific boys, these Scott brothers. I’d blink and Tony would call me to say “H, we got another one coming your way”! But with any film comes a new challenge. The very first few images of this film are Mars in all its mystery and majesty and I’ve never had to score anything like that before. A: Is there any disadvantage to working with the same directors all the time? HGW: I don’t think so. My experience is that Hollywood is built on relationships like that. I can’t remember the last time a director just called my agent or asked me to do a film without me having a prior relationship with somebody. I worked multiple times with Joel Schumacher, Ben Affleck, and Jeffrey Katzenberg at DreamWorks and Ridley Scott. Those are the relationships one nurtures and treasures for that very reason. There can be a shorthand that is quite fruitful. Also, it’s nice to feel like one is trying to strive towards something with a body of work. A: From what you’ve said, Ridley sounds like a very specific director. Do you prefer that to other direction where you’ve been given more freedom? HGW: Yes, I think so. If you picture yourself in any sort of team, whether it’s a sports team – or music team in this case – what you need is a bit of leadership. Otherwise, it’s anarchy. Ridley is the director and in some cases he’d the producer of the film. But he’s not the only producer; in this case there’s FOX, who are a huge studio who have a lot of money so they’re going to want to have their say. However, they can’t really get at me unless they get at me through Ridley. He’s a strong visionary. If they have a huge problem with the music and Ridley doesn’t, then I don’t have a problem. A: Did you look at any other sci-fi films when you were composing The Martian? HGW: There really is nothing sci-fi about this movie. There’s nothing futuristic about it at all. But it’s always intimidating to start at the beginning. The conventions between composer and director have been around for quite a long time but during the first meeting, Ridley showed me the first cut of the movie and we did a spotting session. He’ll decide where he wants music and he’ll say “As that character comes into the room I’d like the music to start quietly and come to its peak as she yells this…”or whatever. And in this case there are 47 music cues. Some of them might be 45 seconds. A couple of them are meaty and are several minutes long. A: The music which you compose which doesn’t make it into the film – do you keep it, and can we expect to hear it someday? HGW: No, I don’t think one sort of puts it in his back pocket. If music is rejected or not used there’s probably a good reason for it. There are a couple of moments in The Martian where I had to have a couple of goes at the scoring. But if there’s going to be 80 minutes of music I don’t think once can expect to score a hole-in-one for every moment of the film. Some moments were up for interpretation. I could have gone this way or that way. There’s a great moment in the film where there’s a Bowie song playing out of which I needed to seamlessly come out of source music into score. We call it ‘scource’ [laughs]. And I needed to be in the right key and the right tempo and then we could leave it behind us but it couldn’t bunk, and my music cue had a very different purpose than what we just heard. That was another quite fascinating thing about the script and the movie; one of the things that Watney is left with is the possessions of the other characters who’ve left. He doesn’t rifle through them in any belligerent way but he goes through them to see if there is anything that can help him survive. The commander, who is the rather gorgeous Jessica Chastain has left behind her laptop, on which he finds a bunch of music. He’s quite happy about that, until he finds out it’s a bunch of 70’s music which he can’t stand. Occasionally in the movie he has to steel himself. He’s quite lonely and he’s going to hear one of these songs, and obviously we hear it as well. There were choices to be made about what are those songs. It wasn’t specified in the script that ‘this will be a David Bowie song’ or whatever it was. Ridley, the film editor, myself, and producers from Fox said “let’s try this or let’s try that”. Often music that is playing counter to what you’re seeing is really cool. There are many scenes in this movie that are quite bleak but the music could be quite bleak and it could work. But what if it was insanely happy and what you’re seeing is someone who is very unhappy – what does that do? Those are the interesting things to toy with and play with and that’s what’s fun about doing film composing. A: Talk about spotting – how closely do you have to work with the editor? HGW: Quite closely. Pietro [Scalia] is a really experienced editor and he and Ridley have worked together before. He plays with temp music, so before I’ve written the score he’s throwing in pieces of music. Because it’s not for a paying audience it could be anything – Beethoven, Pink Floyd, anything! Simultaneously, your composer is coming up a different path trying to cultivate thematic material. It’s a big collaborative process and you can see how sometimes it ends with a complete train wreck [laughs] if there are too many points of view. Working with Ridley it’s clear that he’s a visionary and he knows what he wants to achieve. He doesn’t specify that musically but he’s specific in what he’s looking for in a certain scene. “I need you to bring a little bit more excitement. The actor didn’t do this, or did do this, and I’d like you to play a counter for that…”. He’s left with whatever he’s shot. He’s so experienced that he shoots pretty much the script and then he shoots what he wants. I’ve worked on a number of movies where you’re like “Man, why I am picking up the pieces here? Why do I have to make it seem exciting? Why isn’t it exciting?” But you know, there you go, that’s also what music can do. It can falsify things, but in this case it really doesn’t need to. A: With the Shrek and Narnia franchises you’ve been able to go back and build on your work. Is there any other film that you’ve worked on which hasn’t got a sequel that you’d like to return to and build on? HGW: I suppose that’s rather like saying what films did I really love which I could revisit. Spy Game was always a real favourite of mine. You had the new pretty boy of Hollywood and the old pretty boy of Hollywood and I just loved the interwoven script, and I loved working with Tony Scott. I love Kingdom of Heaven for different reasons. It was Kingdom of Heaven and I’m an ex-Chorister for Christ’s sake. It wasn’t a stretch for me to pull out the chorus stops there. It was great fun for me to do that actually. Working in franchises like the Narnia and Shrek movies, there’s a different sort of challenge there. One doesn’t want to repeat one’s self. One wants to be able to formulate a way of bringing things forward, moving things on while reminding the viewer of what’s come before. I find sequels quite tricky and I’m not falling over myself to do sequels. The second Narnia in particular was quite tricky. I was working with Andrew Adamson who I’d done the Shrek movies for and the first Narnia movie for, and we’ve become great friends. We have a great relationship where he makes me feel like part of the team. I’m sure in some instances a composer might tell you that he’s kind of on the outside providing a service. As I said earlier, the greatest thing that one can hope for is a composer is to feel that they’re part of the team. A: With scores there’s a delicate balancing act between being heard and not being noticed. How do you strike that? HGW: I think some scenes need what we call underscore. Perhaps it’s a dialogue heavy scene with a lot of information being imparted to the audience and they need to hear it clearly. You might say “why is the music there anyhow?” but it can often be a few strokes that you can make with your brush that really help the story and bring another dimension. I don’t think film music needs to be unheard but it doesn’t necessarily need to be front of the stage. With some music cues in some movies you’re definitely standing up there, saying everything that needs to be said. Perhaps there is no dialogue. For instance, in the middle of The Martian there’s a scene full of relief and joy, with a little bit of sorrow mixed in. As Watney leaves the relative safety of his habitation he has to cross Mars in order to see if this rescue is going to happen. The photography is amazing. There is not a word of dialogue so the music does a lot of the heavy lifting. A: Has Ridley spoken to you about the Prometheus sequel yet? HGW: Yes he has. He just told me he was on it. I haven’t seen the script or anything yet. I don’t know whether I’ll be doing it. The Martian is released in UK cinemas on September 30. This entry was posted on September 28, 2015 by Amonymous. 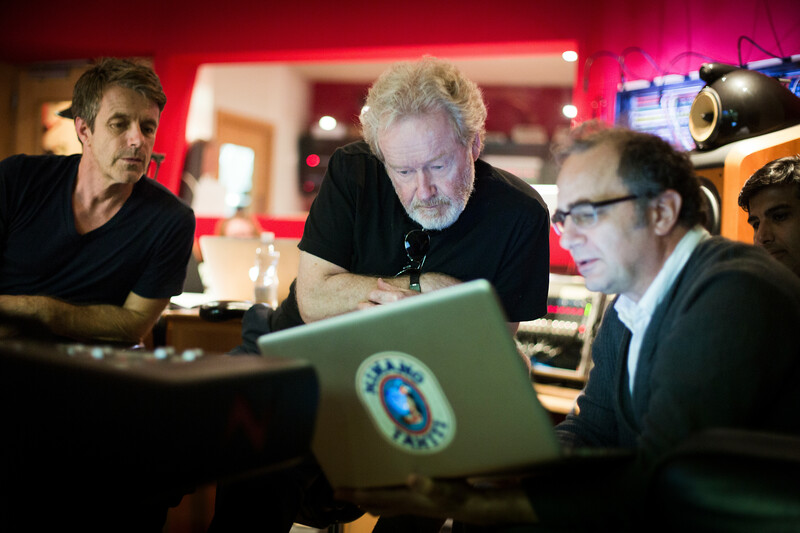 It was filed under Interviews and was tagged with harry gregson-williams, Ridley Scott, the martian, tony scott.